I have been looking into DIY cleaning and laundry supplies for a few weeks now. The thought of all of the chemicals in our house has made me nervous more and more. Also, the cost of cleaning supplies and laundry soap is just ridiculous. I stumbled upon this blog post today from Yesterday on Tuesday. She even provides you with the labels to print out and stick on the bottles! 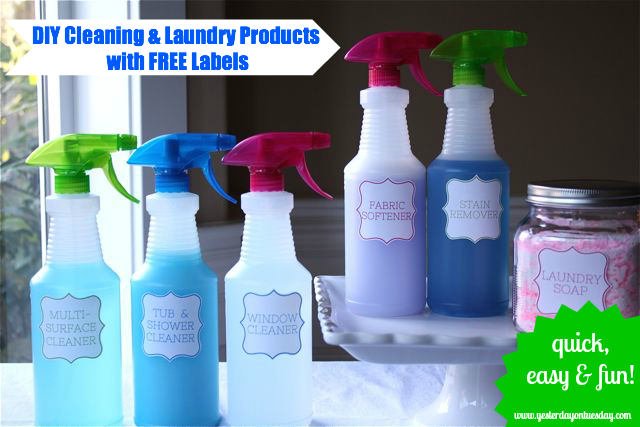 She also has blank labels you can print if you have other cleaners you would like to label. I used the blank labels to write out the recipes and stick on the back of the bottle! If you have any DIY cleaning recipes you use, I would love to hear them! The more money we can save, the better!